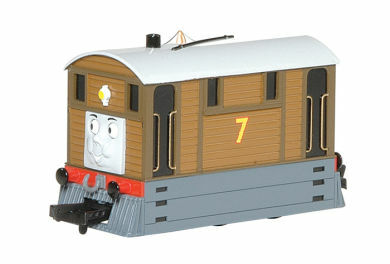 Toby is a tram engine from East Anglia. He is a temperamental engine who acts like a father to all the engines, but they seldom take his advice. He has a coach, Henrietta, who he dearly loves. Like Edward, Toby realised what would become without help, and he welcomes all engines who have come to help. Toby is based on a Wisbech and Upwell Tramway J70 #68221 0-6-0T circa 1914.